Thursday’s ride took me through the thick air of our humid heat wave to Hampden to meet L. for lunch. We know each other on the internet, and we’ve got a lot in common, it seems, so we decided to finally go offline and actually prove that we are bodies in real life. Turns out we are, and we both like to eat at Golden West, which we did before splitting ways, him to his writing hovel and me to a bar to do some grading and sip on some pumpkin pie flavored sangria–grading makes a girl do outrageous things. I took a slow ride home, enjoying the extended fall colors that make this city look all dressed up, all the places to go. I stopped in front of the Lee-Jackson monument, a lightening rod in our conversations about what to do with Confederate monuments in the city. There’s a sign in front of it now, asking people to “join the conversation” of the official working group called by the mayor. Someone has written on the sign, “We did,” and I wonder if that was put there by the artists who erected a sculpture here that was removed quickly, because you can’t put something up on public/city property without permission. Join the conversation, but make sure you talk in the way expected, in the tone required, in ways that make sense to the committee. It’s tough, this demand to think differently using the same rhetorics, not sure it’s going to work. And then I got off the bike and walked a bit, narrowing my vision to Wyman Park, blocking out the cars and the lights and giving myself a feeling of “nature,” just for a few minutes. And then I was home, happy for an extra few days of summer here in November. 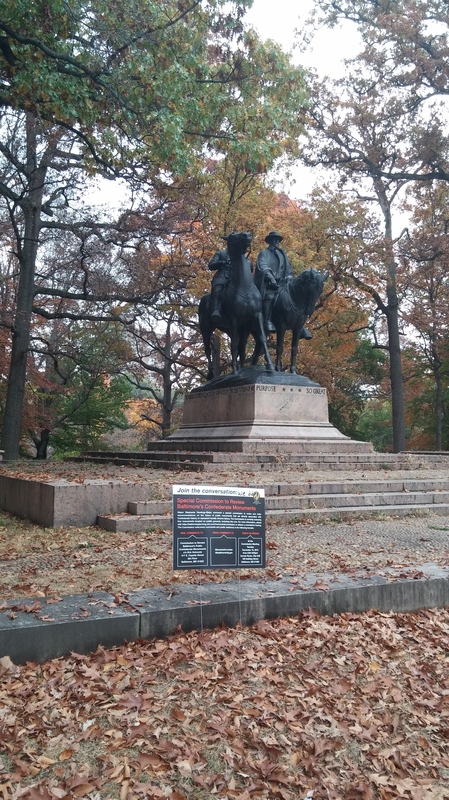 This entry was posted in parks and tagged Confederate monuments, Hampden, Jackson-Lee Monument, Wyman Park. Bookmark the permalink.